Back on Track with the workouts! Make sure you subscribe to The Sweaty Betties youtube channel so you don’t miss any! Tabata training is generally 4 mins. of 4 exercises (16 mins) where you do each exercise for 20 seconds followed by 10 seconds of rest. You can actually do any number of rounds and time, but this is the basic idea. 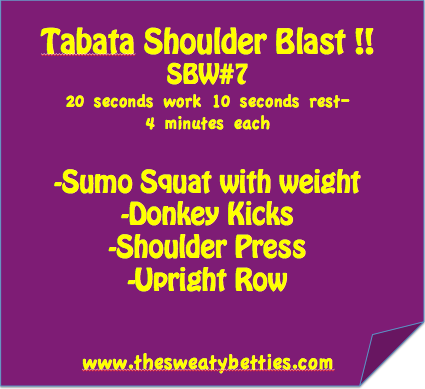 Today’s Tabata workout is SHOULDER INTENSE——> SHOULDER BLAST! So excited to try this! Amd it’s got my new favourite: the donkey kicks! WOW! That was harder than I expected it to be! Thanks for sharing! bahaha! indeed…. have you done workout #5 yet?